Manchester United’s French midfielder Paul Pogba (C) with Manchester United’s Brazilian midfielder Fred (2L) and Manchester United’s Chilean striker Alexis Sanchez (R) after scoring the opening penalty during the English Premier League football match between Manchester United and Leicester City at Old Trafford in Manchester, north west England, on August 10, 2018. 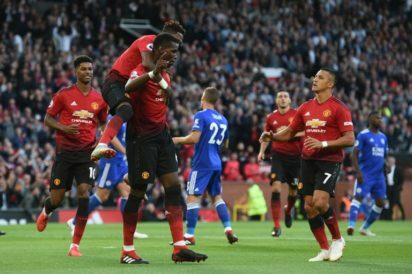 Pogba responded with what Mourinho described as a “monster” performance and took responsibility from the penalty spot to open the scoring after just three minutes of the season. “Of course it makes me proud, it makes me happy to wear this (armband) at a big club like Manchester United,” said Pogba. The man who cost United a then world record £89 million (105 million euros, $116 million) in 2016 was routinely dropped by Mourinho last season, and had been linked with a move away from Old Trafford in recent days with Barcelona’s interest reportedly piqued by his frosty relationship with the Portuguese coach. And Pogba seemed to call for more trust from Mourinho this season.